From the Forbidden City and Summer Palace to the Great Wall of China, this guide showcases the best places China's capital city has to offer. Eight easy-to-follow itineraries explore the city's most interesting sights, such as contemporary art galleries and buzzing night markets. Also included are reviews of the best hotels, shops, and restaurants in Beijing to help you plan your perfect trip. True to its name, DK Eyewitness Travel Guide: Top 10 Beijing covers all the major sights and attractions in easy-to-use "top 10" lists that help you plan the vacation that's right for you. + Comprehensive laminated pull-out map includes color-coded design, public transportation maps, and street indexes. 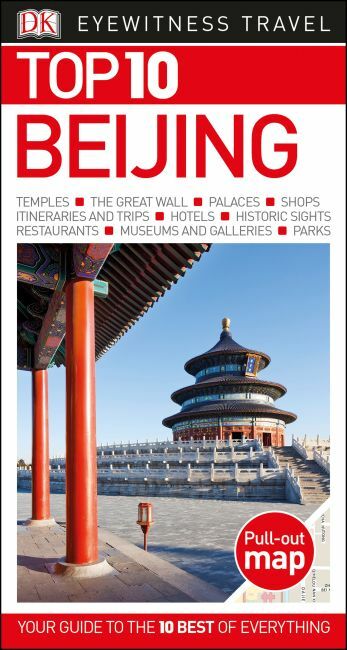 The perfect pocket-size travel companion: DK Eyewitness Travel Guide: Top 10 Beijing. Series Overview: DK Eyewitness Travel Guide Top 10s are handy travel guides that take the work out of planning a trip. Packed with amazing ideas, informative maps, insider tips, and useful advice, DK's Top 10 guides lead you to the very best your destination has to offer. The pocket size make these the perfect guide to take on vacation. Discover the history, art, architecture, and culture of your destination through Top 10 lists, from the best museums, bars, and sights to the places to avoid.